Okay…that time has come again. The BIG game and it’s setting up to be a fun one in Indy. I’m rooting for the Giants. However, unlike the last time these two met in the Super Bowl and the Patriots were trying to make history by going undefeated, I just don’t think Tom Brady will be denied. The Giants are hot and seem to have the most complete team. That being said, the Patriots are quietly hot, too. And, they have one of the best Super Bowl QBs in the game. Brady is trying to match Joe Montana and Terry Bradshaw with 4 Super Bowl wins. He has 5 appearances which I believe now is the most (Bradshaw and Montana 4-0; John Elway 2-2; and Jim Kelly 0-4). More than anything I’m rooting for a great game. I just think in the end, Brady will find a way to win it for the Pats. My prediction – Patriots 27 Giants 24. I’ve been very un-daily in the Daily Dan this week. My apologies! I was thrilled to tie with a couple other reporters last week on the football scores at 9-3. Had I been smart enough to know or look u that Cascade Christian is the defending 2A champ and were playing an 0-6 Port Townsend team, I think I would have had a different pick! Oh well. Hope it’s a great Northwest victory party over those Arizona teams! 1 – The Seahawks Defense isn’t that bad. Chris Johnson got his 2,000 yards but it took hm 38 attempts. Overall, 17 points given up against a pretty good offense (8-2 the last 10 games) is decent. The D-Line still needs help and a guy like Carlos Dunlap from Florida would look great rushing off the end. 2 – The Hawks and Broncos losses give us the 6th and 14th picks in the April NFL Draft. There’s an opportunity to get well quickly through good drafting. Keep your fingers crossed on getting a savvy General Manager. 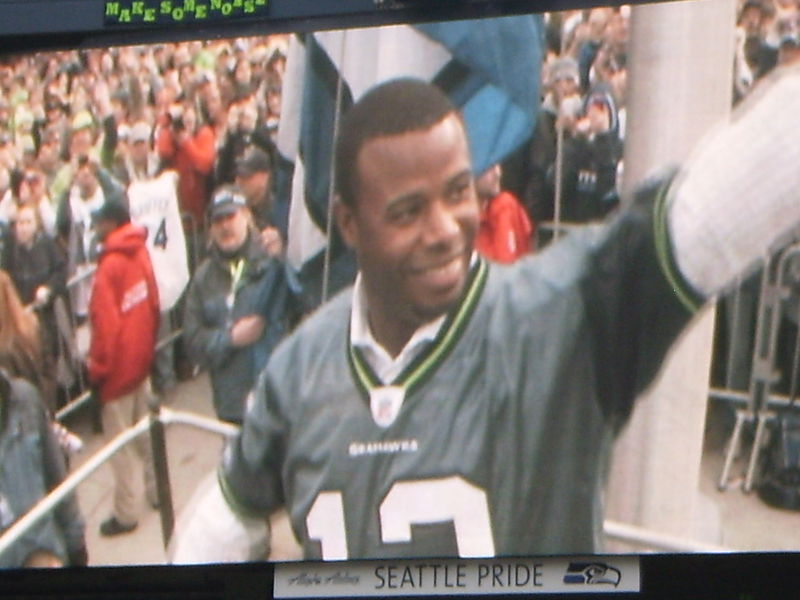 3 – It was a thrill to see Ken Griffey Jr. raise the 12th Man Flag before the game. Probably the highlight of the day. 4 – New Orleans, Indianapolis, Arizona and Philadelphia are in trouble. The former two get a BYE to re-group, but definitely lack momentum. The latter two got slaughtered by the teams they will face next week in the playoffs. Green Bay and Dallas are smoking hot and that usually equals success in the playoffs. My two early upset picks for next week – Green Bay over Arizona and Baltimore over New England. 5 – There’s nothing as great as going to a ball game with your family. Doesn’t matter the sport; doesn’t matter the futility of the team. That’s one of the great gifts sports gives us. The opportunity to enjoy each others company and root, root, root for the home team together. I’m glad my family got that chance to start of this decade right. The Wes Welker injury is a great reminder of why teams will rest key players during the last game. Welker, who led the NFL with 123 receptions, tore his ACL and MCL and is lost to the Pats for the playoffs. The Huskies took a big hit at home against Oregon. Ouch. Oregon came up to the state and beat both the Dawgs and Cougars. Looks like they are back as a program after a two-year hiatus to the bottom of the conference. Mariners Fan Fest is January 30-31. I went last year and highly recommend it as a fun event for the family. Urban Meyer is 45 years old. We are the same age. But at a tie where you are in your prime for most any occupation, Urban Meyer is stepping down as coach of Florida. Why? I spent 6 years as a high school basketball coach. The pressure is nowhere near what a Division 1 football coach at the level that Meyer is faced. It sounds like he already has a condition that is exacerbated by the pressures of big-time college football. It takes a strong person to walk away at a young age while you’re at the top. Jim Brown, Sandy Koufax, and Urban Meyer. Good fr you, Coach. Enjoy your kids and your life. Don’t get me wrong. I love football. I have the DirecTV plan to watch every single game. I love Thanksgiving games. But Christmas? I think both college and pros need to let these guys have Christmas with their families. I know my wife has no ambition to watch the Titans and Chargers on Christmas night. Can’t we just stick with Sunday and Monday games, and exclude holidays except Thanksgiving (2 games max) and New Years? On the first day of Christmas, the Daily Dan told me…Jake Locker for the Heisman Trophy! On the second day of Christmas, the Daily Dan told me…Cliff Lee is now a Mariner and Jake Locker for the Heisman Trophy! On the third day of Christmas, the Daily Dan told me, the Seahawks need an O-line, Cliff Lee is a Mariner, and Jake Locker for the Heisman Trophy! On the fourth day of Christmas, the Daily Dan told me, Man I miss the Sonics, the Seahawks need an O-line, Cliff Lee is a Mariner, and Jake Locker for the Heisman Trophy! On the fifth day of Christmas, the Daily Dan told me, Sark’s the new Dawgfather, Man I miss the Sonics, the Seahawks need an O-line, Cliff Lee is a Mariner, and Jake Locker for the Heisman Trophy! On the sixth day of Christmas, the Daily Dan told me, Emerald Downs is fun, Sark’s the new Dawgfather, Man I miss the Sonics, the Seahawks need an O-line, Cliff Lee is a Mariner, and Jake Locker for the Heisman Trophy! On the seventh day of Christmas, the Daily Dan told me, Zduriencik is a genius, Emerald Downs is fun, Sark’s the new Dawgfather, Man I miss the Sonics, the Seahawks need an O-line, Cliff Lee is a Mariner, and Jake Locker for the Heisman Trophy! On the eighth day of Christmas, the Daily Dan told me, Jim Mora needs more “dirt bags,” Zduriencik is a genius, Emerald Downs is fun, Sark’s the new Dawgfather, Man I miss the Sonics, the Seahawks need an O-line, Cliff Lee is a Mariner, and Jake Locker for the Heisman Trophy! On the ninth day of Christmas, the Daily Dan told me, one more year for Griffey, Jim Mora needs more “dirt bags,” Zduriencik is a genius, Emerald Downs is fun, Sark’s the new Dawgfather, Man I miss the Sonics, the Seahawks need an O-line, Cliff Lee is a Mariner, and Jake Locker for the Heisman Trophy! On the tenth day of Christmas, the Daily Dan told me, No Tiger on the Tour, one more year for Griffey, Jim Mora needs more “dirt bags,” Zduriencik is a genius, Emerald Downs is fun, Sark’s the new Dawgfather, Man I miss the Sonics, the Seahawks need an O-line, Cliff Lee is a Mariner, and Jake Locker for the Heisman Trophy! On the eleventh day of Christmas, the Daily Dan told me, the Seahawks need a GM, No Tiger on the Tour, one more year for Griffey, Jim Mora needs more “dirt bags,” Zduriencik is a genius, Emerald Downs is fun, Sark’s the new Dawgfather, Man I miss the Sonics, the Seahawks need an O-line, Cliff Lee is a Mariner, and Jake Locker for the Heisman Trophy! and Jake Locker for the Heisman Trophy! 1 – Where’s Housh – T.J. Houshmandzadeh was the big-time free agent signing for the Seahawks and has been a disappointment. Trust me…I have him on my fantasy football team and I know the production isn’t there. It’s not his fault. It’s not Matt Hasselbeck’s fault. Blame goes to the offensive line and Greg Knapp. The O-line has been awful (next bullet), but Greg Knapp’s offense isn’t run to take advantage of Housh. T.J. is a better version of Bobby Engram and would have been perfect in Mike Holmgren’s West Coast offense. Add to it that Hasselbeck has struggled due to a different tempo. Bottom line – either change the offensive schemes to match your talent or get a new offensive coordinator. 2 – The line protecting Hasselbeck is truly offensive. So bad, it almost got him decapitated several times. Coach Jim Mora already called out the line and intimated changes. Change to who? This is an area that must be heavily addressed in the off-season or mediocrity will continue into 2010. 3 – For Mora to survive this position past 2010, he must significantly improve the line of scrimmage on both sides fast. He must take a hard look at his assistant coaches, and he must hope for a new General Manager that will give him some rope. He has control of two of those items. Bonus – This just in. Accenture just cut Tiger Woods. The management consulting company came out and said his new “image” isn’t what they are looking for. This won’t be the first defection from the Tiger team. Here’s hoping you slide in ahead of the tag today!